Mesmerizing is a special word to express ones feeling. If it is a Mesmerizing Dream then people would cherish it. If it is collection of Mesmerizing Dreams, then you can image how sweet it would be. Here, a poet shares her ‘Mesmerizing Dreams’ and the poet is Scribbling Gal (SG). She is a versatile blogger, romantic poet from New Delhi, India. She love reading books and her favorite ones are Snow, The Lost Symbol and The Diary of Anne Frank. Her interests are ‘Cooking’, ‘Dancing’ and as all know ‘Poetry’. and her words would make any person to fall in love with her dreams. She is such a sweet romantic writer who reflects her moods as words. 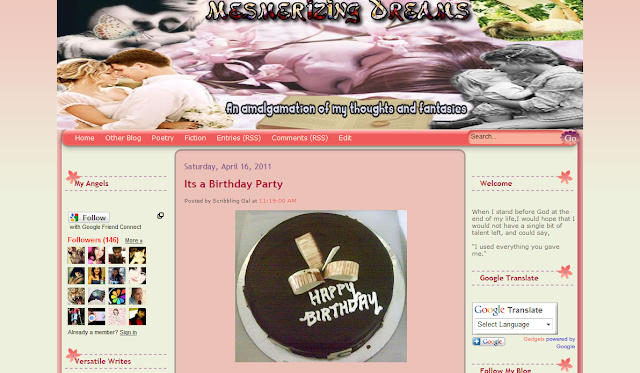 ‘Mesmerizing Dreams’ is a poetry blog reflecting her moods, and to express her love for poems. It is an amalgamation of her thoughts and fantasies. Not only the words reflect her but also the design as the header image reveals the blog is about a dream of love, romance and affection. It is a perfect girl’s blog as you can see girlish colors all over the design, perfect header image, body and footer that carries the copyright information (PS: Her original blog name is My Personal Journal). The blog has widgets like ‘Google Translate’, ‘BLOG ARCHIVE’, ‘SEARCH BOX’, ‘FAVORITE BLOGS’, ‘LABELS’ and ‘VISITOR NUMBER’. ‘Google Friends Connect’ and ‘Networked Blogs’ helps her blog readers to be in touch with her blog always. The archive of the blog says that she pens down from February 2010. If at all in this world, can someone define a ‘dream’ then I can. ‘Dreams’ are sweet to hear and so her poems. Her words have the power to express deep thoughts and they are straight from her heart. Well aging just over a year, she has penned 74 posts and most of them being poems. She is close to 150 Followers in Google, result of her ‘Mesmerizing Dreams’. I do like all her poems, and from her recent posts, ‘Memories’ & ‘Revival’ are my personal favorites. ‘I believe’, ‘I Love You’ and ‘Hidden’ are my all time favorites from her pen out of the 74 posts she penned so far. SG, I personally feel that you should link your Facebook Page to your blog and to add widgets like ‘Recent Posts’, ‘Recent Comments’, ‘Popular Posts’ and etc., in your blog to help people know about your blog easily. This is Someone is Special, the author of Few Miles, hosting Review Tuesdays along with Leo of I Rhyme Without Reason. Enjoy the beautiful creations of Sribbling Gal as I do. Stop by ‘Mesmerizing Dreams’ to enjoy her poetries. Have fun! Jingle Poetry Rocks! one of my fav blogs!! love the emotions she captures in ech of her post !! Lovely review, SIS... 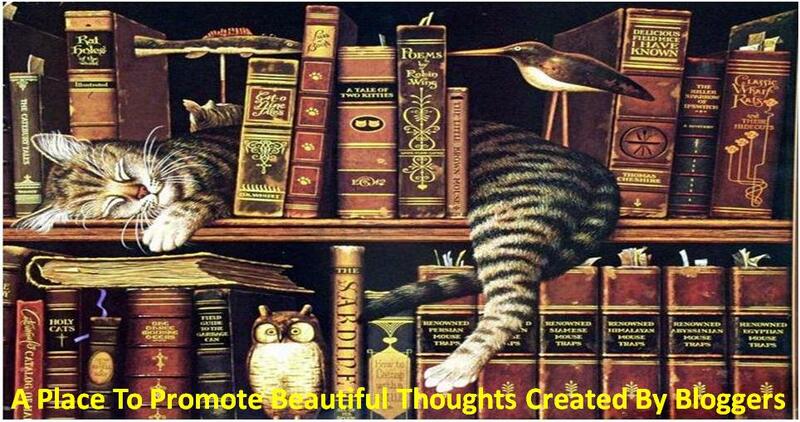 Yes, her poems are beautiful..and I will visit her page more..
Scribbling Gal has great work on her blog. This particular poem "Mesmerizing Dreams" is beautiful. Thanks SiS for a lovely review.